Well, if that was the plan, that definitely backfired - think of all of the manips added in the past four dips! What is your least-favorite newpix? Hi everyone. I can't believe the OTT is still getting so much amazing content. This is actually just a filler post to get me closer to 5. I've been working on something, and I'd rather post it as an image. So, a couple more to go, I guess. Maybe next I'll tell you about a third-party timewaiter, my best lady, who just listened to my updates (verbaketchups) every few days and seemed to enjoy the OTC and what you all were up to by proxy. shirt easily enough and not infringe. Likewise "I waited for it", or "I waited for one darkening pixel". Stuff like that is fine. But not his art. BlitzGirl wrote: Well, if that was the plan, that definitely backfired - think of all of the manips added in the past four dips! I'd had the same thought. If anything, uploading has increased. That's easy ─ np1212-1216, the parking lot. Last edited by Kieryn on Wed Jul 31, 2013 1:00 am UTC, edited 1 time in total. Was pondering a fitting tribute to Time and The End in song form and felt this one had something to offer. Hope you like it! Last edited by dawnfire on Wed Jul 31, 2013 1:07 am UTC, edited 1 time in total. 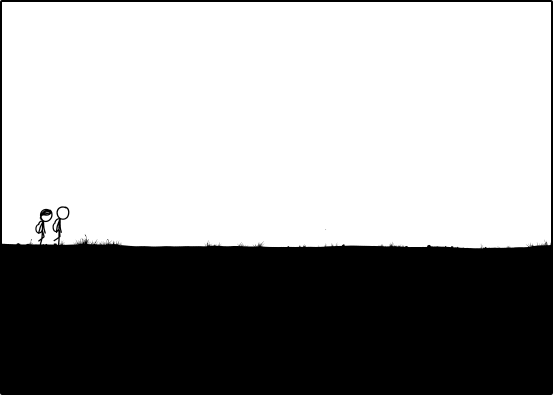 About shirts and copyright: others in the xkcd community have done shirts with Randall's art before, strictly on a no-profit (at cost) basis. I don't know if he's ever known about it or if he would care, but there is precedence of a sort. dawnfire wrote: Was pondering a fitting tribute to Time and The End in song form and felt this one had something to offer. Hope you like it! That is lovely. I always loved the original (and accompanying movie), so it's especially touching for me. Thank you! Ximenez wrote: Latent22: The video test is amazing. I love the timing and the atmosphere added by the music (can't waitWell... for yappo's original music!). The voices sound really good. And I like the colored frames a lot (although I can imagine some clamor for a colorless version). Thanks for sharing it! Yeah I've set it up so I can render either colored or non colored versions by moving a couple of folders around as I plan to have a pure black and white version as well. This is just a test for adding music and color while I wait for more VO audio to roll in. Anyone wanting to add their voice in can pick a character from the Dialogue list that needs voicing and post it here. Note their are little speakers showing you which frames have already been done. Also need audio samples of sound effects if anyone can make some or find some that are released free or under a good license. Also have a few frames from 3057-3059 that we need someone to work out who said the frames to make it easier for someone to do the voice over. jjjdavidson wrote: But we can still give T-shirts to each other, right? That too could be a problem. It might be OK with GLR to make a one-off for yourself, but someone has to be convinced that it is ok to make it. "I heard you're idea's and their definately good" ─ I've never dealt with a print shop on something like this. But I'm not worried about the moral aspect, as long as we stay strictly non-commercial. A Creative Commons license is a deliberate choice, and Randall makes it clear he understands it. But any shirts (or whatever) we make must definately include a reference to "http://xkcd.com/1190/". poxic wrote: About shirts and copyright: others in the xkcd community have done shirts with Randall's art before, strictly on a no-profit (at cost) basis. I don't know if he's ever known about it or if he would care, but there is precedence of a sort. No profit and non-commercial are not the same, I think. If you want to honor the man, don't do that sort of thing without his explicit permission. Some things he might not object to, perhaps, but some things would appall him. I think the "ideas" page on the wiki is a good idea, especially if it comes with a disclaimer of copyright or a public domain license. But he will have trouble using the art there, for the same reason we have trouble using his. It was created by another person, who automatically holds copyright and can license it, however they like. On the other hand, you can't copyright an idea. So some things that look like they should be infringing are not and some things that you would think are ok, are infringing. But, like I said above: If you want to honor the man, be careful of what you do with his art. I hope we do not anger the admins. My biggest fear nowadays is that I will open the OTT and see a final post reading, "Thread locked." taixzo wrote: I hope we do not anger the admins. My biggest fear nowadays is that I will open the OTT and see a final post reading, "Thread locked." I'm sure we'd see some red text before they went that far. Besides, now that GLR himself has acknowledged our community they cant kill it. We won't let them. Sigh. Yes, but, you seem to be ignoring "noncommercial". It is a very important word here. A CC license is not "public domain". He uses a CC-BY-NC license. NOTE THAT is is NOT CC-BY, or CC-BY-SA. It is CC-BY-NC. Don't try to finesse it. See http://creativecommons.org/. Read it and understand. In that case we'd just have to PM everyone who has posted recently and find a new place to go. fhorn wrote: Don't know if anyone saw this, but apparently the Chicago Tribune's test page may have included a redundakitty today. I literally just saw that on Boing Boing. Last edited by wizpretz on Wed Jul 31, 2013 1:46 am UTC, edited 1 time in total. Yeah its a tricky situation with non commercial licenses like that. If a company makes a t-shirt for you with this content then they are making money off this intellectual property. Trying to do things at cost price doesn't always get around this. Their are some ways to do it like buying a blank t-shirt and then buying a inkjet thermal transfer something or other and printing an image on your own printer at your own expense and then adding it to your T-shirt. This situation does not cause a problem with the license (assuming you also add appropriate credit to satisfy the license). But then you go selling those t-shirts to others... If you make money out of this you have broken the license and even if you sell them at exactly cost it's still a very grey area. jjjdavidson wrote: Minor rantpost: Now that Randall has made a blag post about Time, people keep saying, "That's why the ending was so rushed! The frames were taking over an hour to draw!" Has nobody pointed out the backwardness of this reasoning? Yeah, the frames I wanted were a week of watching those rafts bob on the sea, maybe even just the black of night at intervals, so I could worry about them for a week and feel even more touched and nervous when Megan called Cue to build the sandcastle and super-relieved when they stepped onto land. But... what if GLR was actually lurking here? Here doesn't slow down no matter what he does. What if he got sucked in? Here takes a lot of time. Or, if he wasn't reading himself, maybe he wanted to stop before a bunch of us lost our jobs? Last edited by ggh on Wed Jul 31, 2013 3:19 am UTC, edited 1 time in total. Sorry, I'm not ignoring "non-commercial"; I'm just failing to understand how me making a T-shirt and giving it to you isn't non-commercial. Am I missing something? I really love all the color manips that have been posted, and the creative use of different tools and media in so many of them. My own creative thoughts have been running in a different direction recently, though. Here's a preview that might give you an idea of the project I'm contemplating. fhorn wrote: I think things have finally quieted down a little. Steakish! I'd suggest that the background music fades out when there's dialogue; as it is, the dialogue is sometimes difficult to understand, and at some points it seems like there are jumps in the background music when the speaker switches. But overall, very treeish! lmjb1964 wrote: 7terful! (I think that's the right footnote.) <-- That's for ZoomanSP. Yes, it is. I'm following mscha's standard (ni ni ni ni molpy molpy molpy molpy grapevine grapevine). HES wrote: BeautifulDo we have a footnote for that? Rule110 wrote: I really love all the color manips that have been posted, and the creative use of different tools and media in so many of them. 7, that's truly a seaish project! Last edited by ZoomanSP on Fri Aug 02, 2013 9:51 pm UTC, edited 1 time in total. intheshax wrote: Hi everyone. I can't believe the OTT is still getting so much amazing content. This is actually just a filler post to get me closer to 5. I've been working on something, and I'd rather post it as an image. So, a couple more to go, I guess. Maybe next I'll tell you about a third-party timewaiter, my best lady, who just listened to my updates (verbaketchups) every few days and seemed to enjoy the OTC and what you all were up to by proxy. In my opinion (and please let me know if I am wrong) I think part of Charlie's concern is also along the idea that, if I go online and buy a custom made shirt, using a frame, or piece of a frame from Time, and then give it to you, it is the shirt company that I bought the custom shirt from who got all my money. GLR gets nothing. Now, if I do that and then sell the shirt, there is definitely a license violation there. But still, there is the moral aspect of whether or not we should be giving our money for merchandise (even though it is custom designed) to a shirt company, and not to Randall. So what I think we need to do is convince GLR to allow us to design shirts for his store! Very little work on his part (except placing the orders through his vendor). Perhaps he can choose which designs to use from the wiki site. How wowterfull would that be? This sounds like the five of cups. I agree a hat helps make the stick figure an OTTer, but it needs to be a somewhat outlandish and clever hat. Probably colored too, to make it stand out. But more to the point, perhaps the five cups the OTTer is looking away from could be parts of the OTC, including the Voldemort moment. I'm really looking forward to the tarot project! @dawnfire - Beautiful ottification of "Somewhere Out There"
BlitzGirl wrote: Fear of a frame only increases fear of The End itself. What we need is exposure therapy! Congratulations, you have reached THE END of exposure therapy. § PTSD: Post-Time Stress Disorder. ♥ BGSC: BlitzGirl Spoiler Compulsion. So really when someone says "It's ok for me to copy this because it's covered by fair use" they really should be saying "It's ok for me to copy this because If they sue me I'll get off it because of the fair use defense"
But also to your example what is the difference between a photocopier company and a t-shirt printer really. A lot of it comes down to the fact that photocopying places just generally ignore copyright issues and just assume that no one will ever sue them for the few micro cents they make in profit from their activity. Companies making higher margins are more worried about copyright holders complaining. I am glad you are still working on the tarot card set. From what you describe, and I agree with Ucim that it sounds like you are talking about the Five of Cups, then perhaps the stick figure should be holding the hat at their side, rather than wearing it, as one does as a gesture of reverence or mourning. I do not know if it would be required that the hat be any particular hat from the OTT, but certainly it must be outlandish and clever, as Ucim stated. Blindpost from the previous page. I missed my bus. But, I'll be able to stay the whole night with y'all! Yeah there is a bit of a problem with the way the audio is combined back together with my build scripts. To fix the sound properly I have to go though the process of rendering out the audio and replacing it at the last minute. To fix the music fade during speaking the only way I can come up with to do that is to export the script audio as above and then combine with the music track and twerk the volume down during the VO bits and render that audio before combining with the original video. Bit of a manual process I would prefer not to do too often! So probably won't go to all this time for test versions and wait till i've got more of the final VO audio sorted first. A thought occurred to me this evening, regarding OTTifications. It occurred to me (as I have already stated) that we are a very international group, here in the OTT tribe. Yet, we are rather English-centric. Granted, there are obvious reasons for this, but I feel that perhaps some non-English OTTifications would be just as wowterful! I very much enjoy a great deal of music I do not understand. So perhaps this is a request, a challenge, or just an open invitation, but I do hope that some OTTer would feel so inclined to provide us with an OTTification in their native language, should they be so inclined to do so (though, if you do, perhaps a provided translation would also be appreciated). 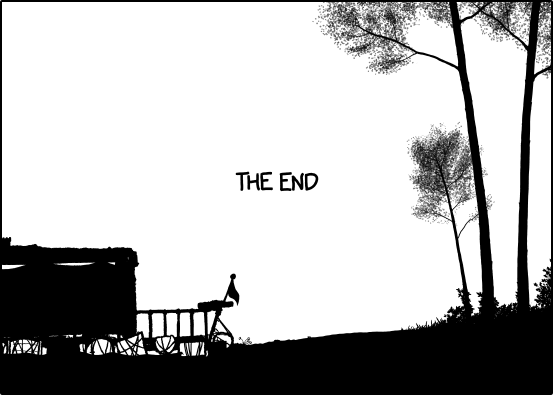 Way back on March 25th, since I read the tool tip of that day's comic, I came back to xkcd and saw that the image was different than earlier. Having been amazed at some of the stuff that GLR has pulled off in the past (cough drag cough) I "wisely" put down another bookmark and blithely went on my way. For several months I checked it every so often in addition to my morning e-jaunts through my webcomic bookmarks, and that seemed sufficient. I could tell that I was missing images, but there never seemed to be drastic changes. Little did I know what I was actually missing. Then things started changing rapidly. Wait, where are they walking too? When did they find that tower thingy? A cathedral!?!? But through it all I was never motivated to dig deeper. Until, believe it or not, Friday July 26th (I'm sorry, I know it still must hurt). I don't even remember now what the image was that prompted me to break out the google, but I did. 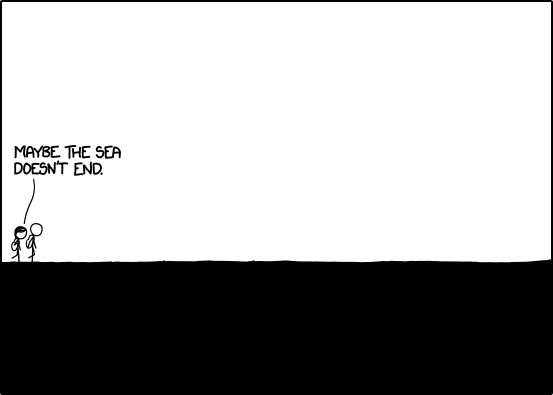 And found the Explainxkcd wiki (wonderful btw) and links to all sorts of useful things, like Time players. And I played it… and I was stunned. All this! This was going on the whole time! Every hour! After going through it a couple of times and doing a few other searches, I plopped onto one of pages of this very thread. Oh my word, what was going on here. People speaking in tongues, technical analysis of time and place. Thankfully I was off that day (unfortunately I had a to do list that didn't). I bounced between random pages of the thread and the wiki. It was amazing. But the outside intruded and off I went, another few bookmarks richer. So I log back in on Saturday, with my unearthed my copies of the Gandalara Cycle (from way back in the bookcase) and there it was. Game over man, game over! Like many of you I was taken aback, but maybe for a different reason. I mean, I had just found all this. I picked up my bookmark and started reading, and reading, and… oh, listening. Amazing job on the "Every Newframe's awefulsome" video YappoBiscuits. I finally caught up around pg. 1286, not counting the 1000+ previous pages I know nothing about. And I just sat there, and thought about it. I must say I am very impressed with what you all… sorry, all y'all, have built here. To me forums are something to get in, get the information you need, and get out, preferable before you see anything too toxic. But this place appears to nuture not only whimsical fun, but some serious talent and brain power as well. I am bummed I was not able to join everyone on this journey as it unfolded. I have started from page one and am now working my way through this thread. It's quite interesting to see how it all unfolded (I'm on pg. 66 I think). But at the rate you guys are generating new pages, it'll probably take me (lets see, thats 12, carry the 2…) oh, I don't know, like two years yips to catch up to your present. But I hope that, when I finally see that day, there will still be some OTTer's there to say hello. And by the way, if you guys could convince GLR to produce that t-shirt with the first frame on the front and the last frame on the back… I desperately want to give him money for that! I don't remember who came up with that but it is a perfect summary of this whole experience. and in the span between I exist. Sorry about the newb-plosion. I guess between catching up and Outside requirements I built up a few things to say. Time to put the shoulder to the boulder for a little bit and see if I can't get it closer to the top, which seems to keep growing. I do hope that I did not screw something up on the wiki, but I just added more OTTer t-shirt designs. I used a table, since I felt that was easiest. I wanted to ask about a few things, but I did not know if anyone who has also edited that section would get notice if I started a discussion. Should I ask away here, or just start a discussion on the wiki? Also, I need to go back to the posted list and get non-graphic suggestions to add to the page as well. Unless someone else gets to them first. Still on the same page. Yeah, I fell in love with Dr. Who when I lived in Australia as a kid (The Five Doctors Special!!) and left to return to the USA shortly after Colin Baker became the Doctor and it was a looonnggg wait for the return of the show here, especially with the tease of the one shot movie with Paul McGann right in the middle of the wait. Looks good, k.bookbinder - thanks for doing that! As far as I know, the page hasn't been seriously edited since April, so you really have free rein of the place, I think. Might want to ask questions here - I'm not sure if they will be seen on the wiki. Maybe both places. PTSD, indeed. I think I have some of that. I'm compelled to ottify things.